This otherwise fine Italian game poses a problem to my collection, or at least to this website, since the same box has been used for a different game. 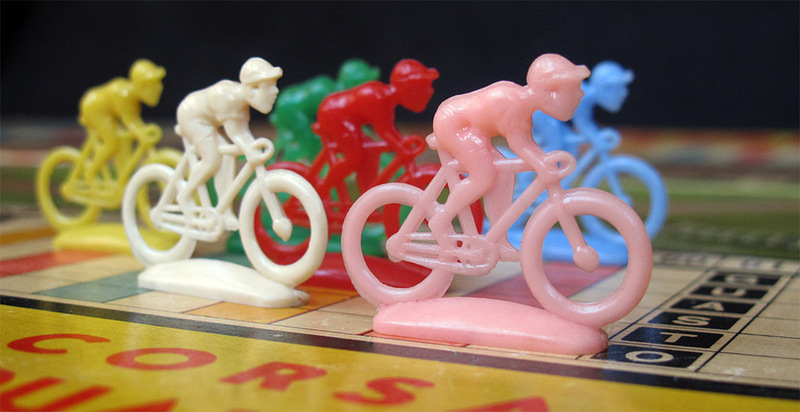 Of course both games have the same title, and also share some other elements, like the riders and even the rules (or at least the rulebook), but I do not think that they are the same game. This causes a problem to all the thumbnail-based sections of this site, like "all the games" and the different categories lists, since both games are represented by the same thumbnail, which can be a little confusing. However, since I do not own a copy of the other version of the game, it is represented in the aforementioned sections with the thumbnail and a little red dot (as explained in the FAQ), which, I hope, helps. Of course, the day I get a copy of the other game, the red dot will go away. My guess, and so far it is only a guess, is that this version was made first (probably in the 1950s) and the electric version was made somewhat later (in the 1960s), and they reused the boxes and other parts of the game. By the way, there is a third game by what might be the same maker. 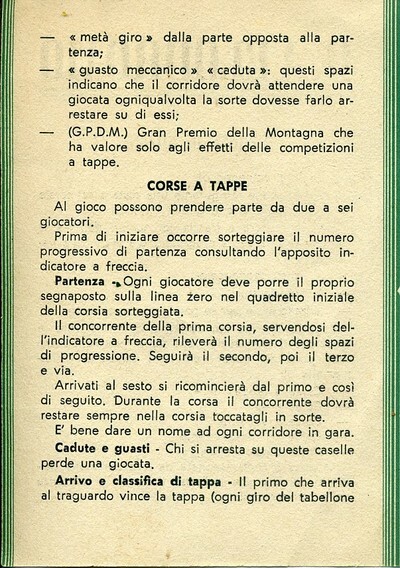 The difference is that this other game is credited to "Edizioni Cicogna" (from Villasanta, Milano) while the two games that share the box are credited to "Creazioni Cicogna". I am not sure if it is the same maker. Maybe my Italian friends have something to say about that. 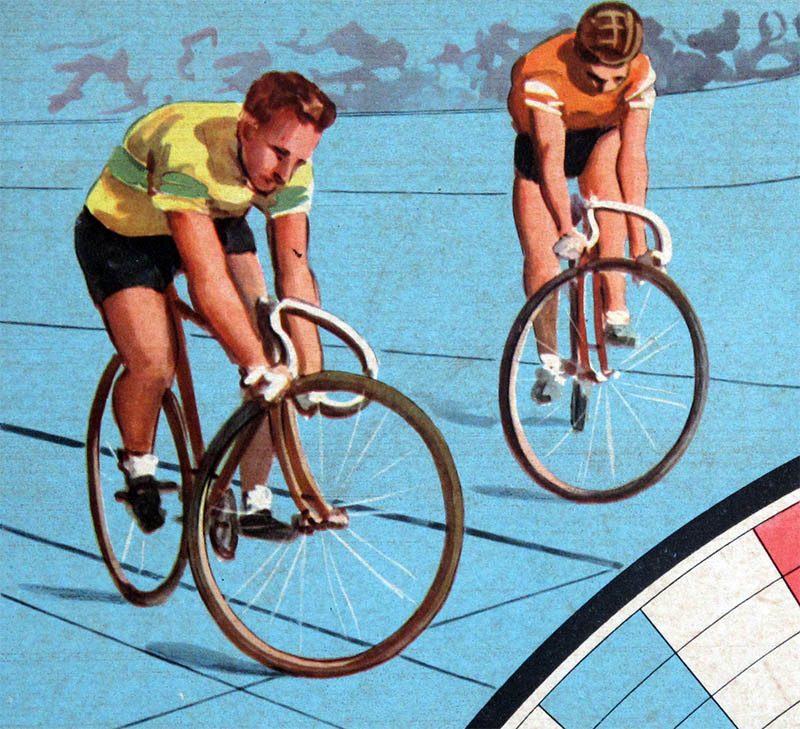 By far, the best of this game is the nicely illustrated board, which measures 74 x 50 cms. Though it is made of surprisingly light carboard for a board of this size, it does not bend (at least mine does not) and is perrfectly playable. The illustration on the box is signed by one E. Massaro. Since the board is not signed and I am not sure if the board is by the same illustrator (it does not look like it) I do not credit him as the author of the game, at least with the information I have. Again, if someone knows better, let me know. The box, by the way, measures 41 x 31 x 4.5 cms. 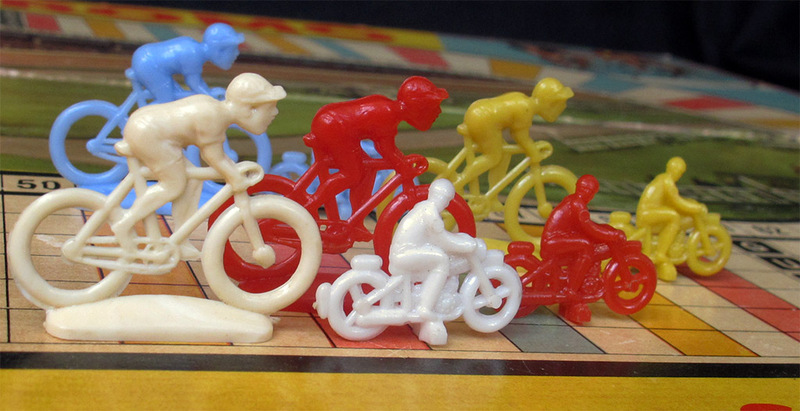 As you can see, there are six lanes on the board, one for each rider. At first sight these plastic monochrome cyclists might remind of the French metal riders made by Roger (the ones known as "long nez") but it is just an impression you get on the photographs. These are much smaller; they just measure 32 mm (while the Rogers are 50 mm long). 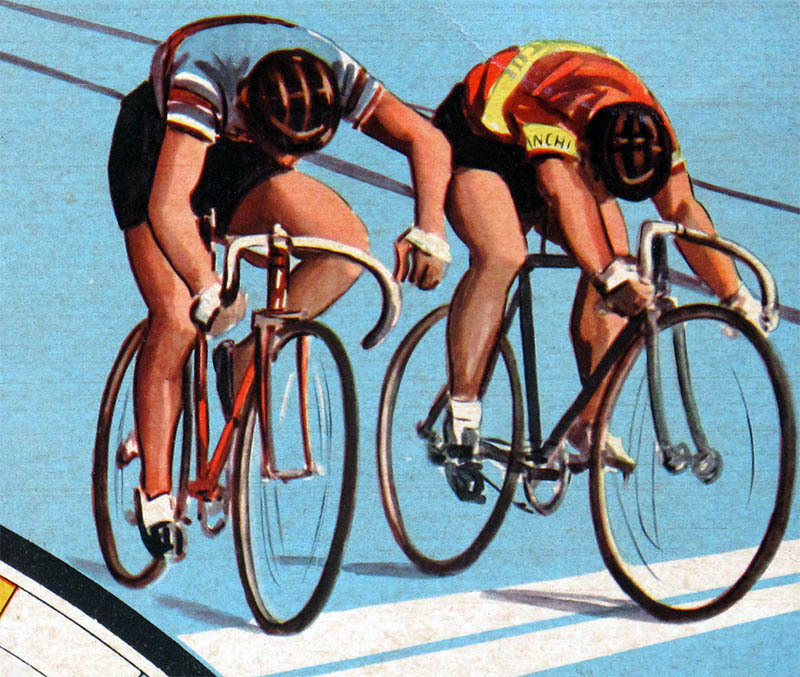 Two lone riders (probably in a pursuit race). 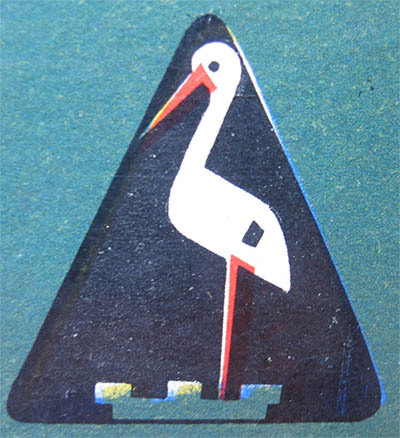 This is Massaro's illustration. The motorcycle and the rider look definitely pre-war. These are the riders featured on the center of the board. They do not look like they have been drawn by the same hand, and they also look more modern. Furthermore, the Bianchi letters in the jersey's sleeves were used (roughly) between 1950 and 1966. However, remark that the the jersey colours are not the expected white and blue Bianchi colours. Nice film camera and bullet microphone. I have some other games featuring filming crowd. 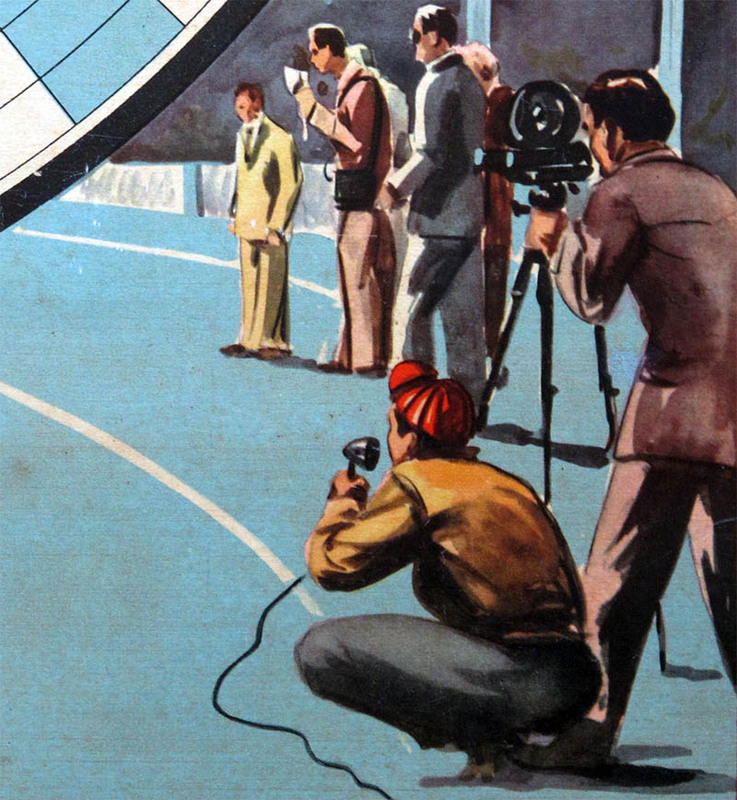 Maybe some day I will write something about audiovisual media featured in cycling games. 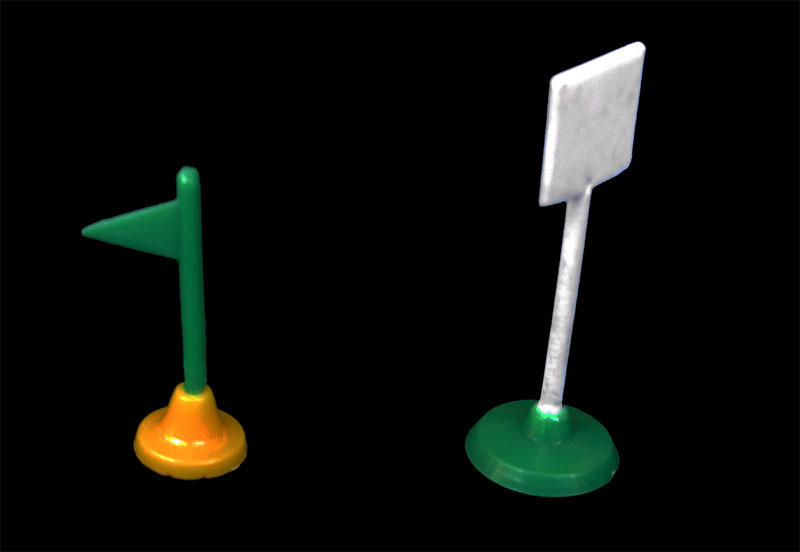 The game also features two small pennants. The one on the left is original but unfortunately the one on the right is a replacement. 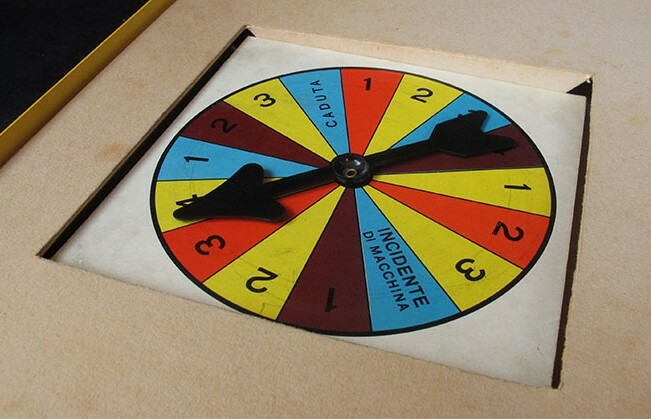 This game, though purely luck-dependant, does not use dice but a spinner, which is conveniently located in a depression in the box so that it does not damage the board. As you can see, the highest number on the spinner is a 4. Considering the board is 96 squares long, this game will certainly keep you busy for a long time, specially since the rules mention 10 or 12-lap races. 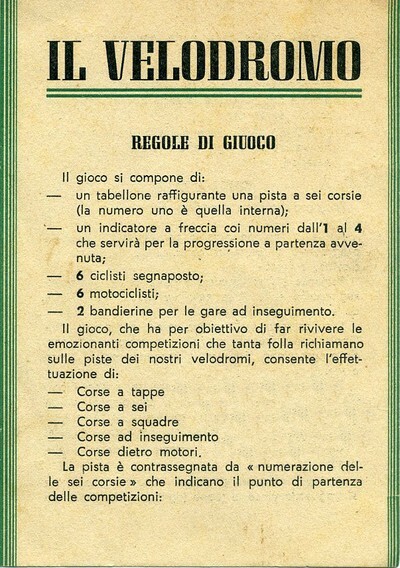 The rules mention five different types of races, one of them being a stage race, in which there is even a "king of the mountains" classification. (You may not see clearly on the picture of the board, but the squares 25 and 73 are marked with the letters "G.P.D.M." 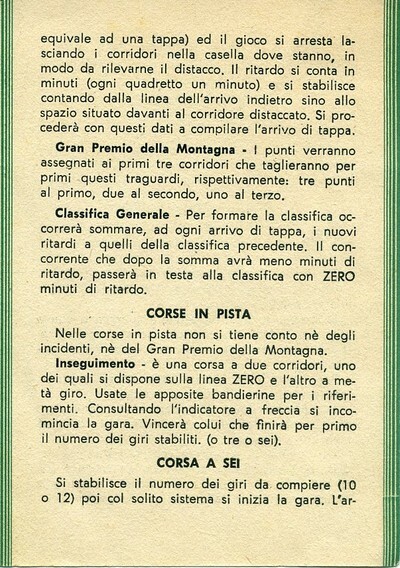 which mean "Gran Premio della Montagna"). 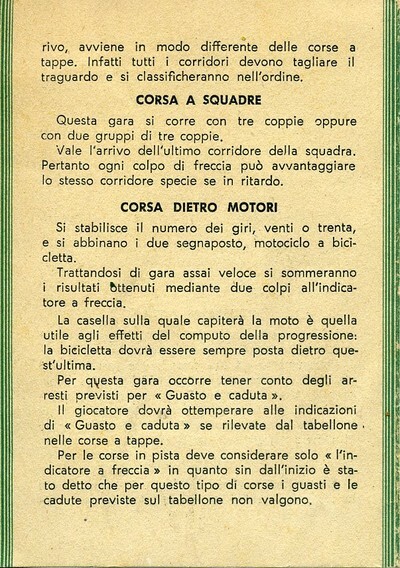 This special squares, as well as the other two on the board, "Guasto" (breakdown) and "Caduta" (fall), are only used in the stage race. 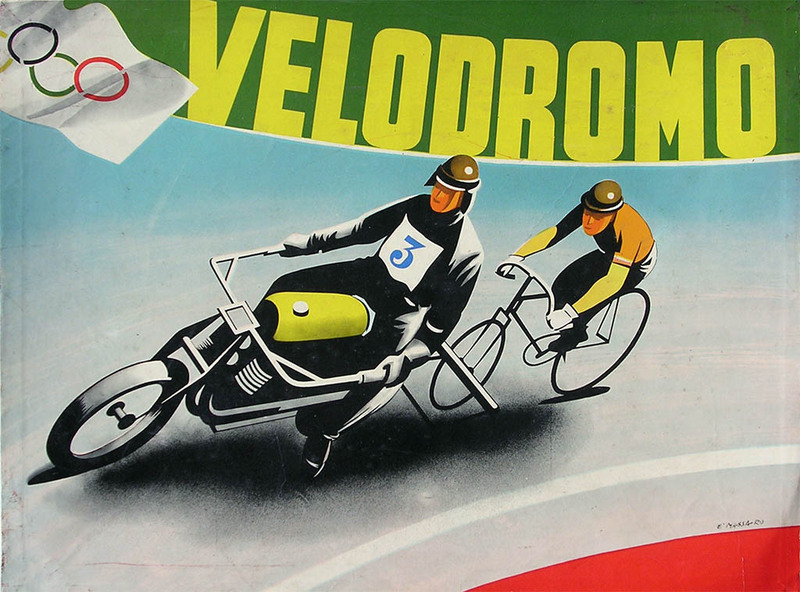 In spite of these stage race rules, I add this game to the velodrome games list. 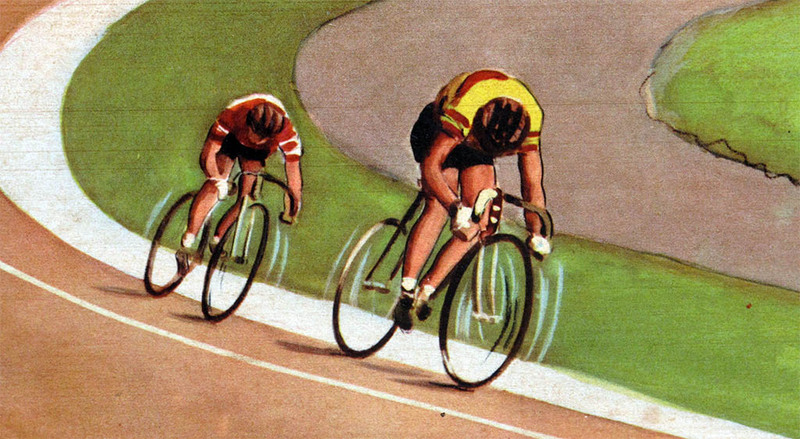 The track events do not have incidents except the paced race, in which the incidents used are the ones in the spinner, not those on the track. 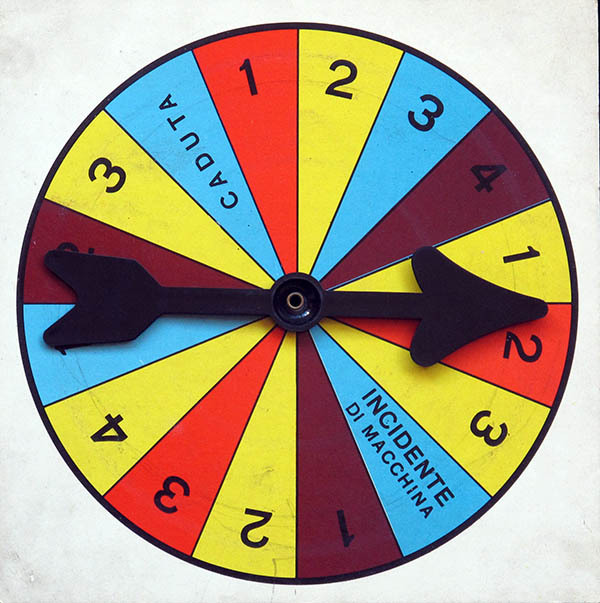 In the spinner there is no "guasto" but "incidente di macchina", which means roughly the same (though it is probably meant to be applied to the motorcycle). Anyway, though it is somewhat ambiguous in the rules, all the incidents just mean "skip a turn". By the way, these are the same rules found on the other version of the game. It is obvious that they do not belong there since the board is quite different. 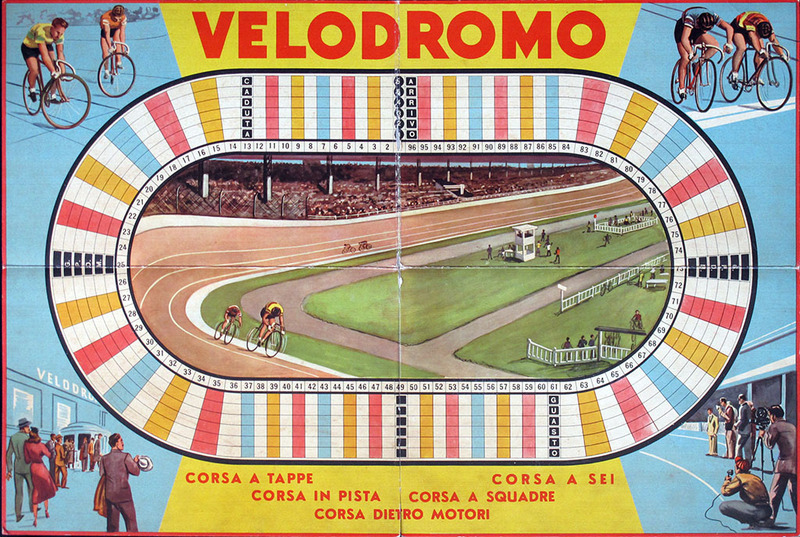 Try, for instance, to play a "corsa a sei" (six rider race) on a board with just for lanes! 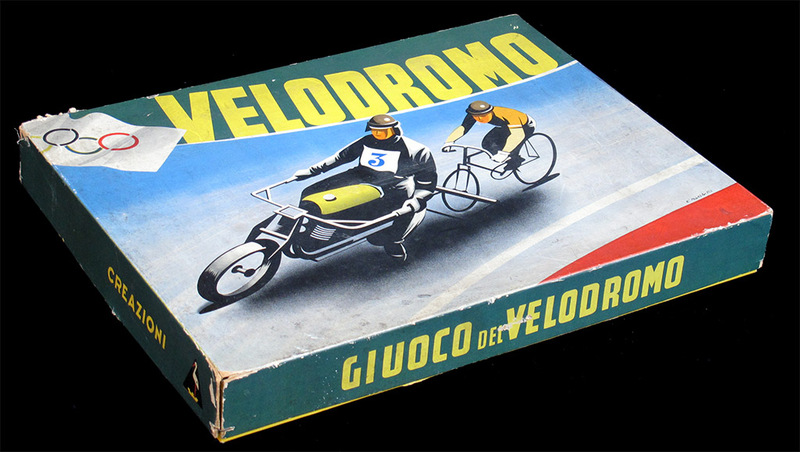 Close up of the "Edizioni Cicogna" logo on the side of the box. Thanks to Marc Radenac for the tip allowing me to buy this game.